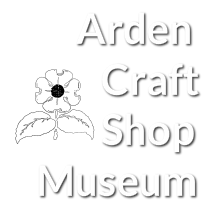 As we process archival material at the Arden Craft Shop Museum, we will create and post finding aids online to aid researchers. If you are interested in accessing these materials, please review the finding aids and contact us using the Research Requests form. For more information on researching and reproducing items in our collections, please see our Schedule of Fees​, Request for Reproduction, and the "Access and Use" section of our Collections Policy. Abstract: The collaboratively amassed ephemera of the villages of the Ardens include correspondence, newspaper clippings concerning the villages and their events, theatre media, local periodicals and other publications, published and unpublished writings of resident authors, and personal files of residents. Note: Throughout the collection and finding aid, the village of Ardencroft may be referred to as Arden Croft. This is to comply with the Library of Congress subject heading authorities, but it always refers to the village founded in 1950. Similarly, the Robin Hood Theatre is occasionally listed as being located in Arden, but it is located in Ardentown. Abstract: The William Penn “Bill” Frank Collection consists of manuscripts, journals, research notes, correspondence, and newspaper articles created by Bill Frank, mostly from the 1930s to the 1980s. It also contains correspondence from Frank’s friends and newspaper articles regarding Bill Frank. Abstract: The Betty Solway Smith Collection consists primarily of newspaper clippings and programs related to Delaware theater productions from 1954 to 1960. It also contains materials regarding Ardensingers, the Arden Folk Gild, the Arden Club, the Arden Fair, Ardentown leaseholders, Arden and Solway family news clippings, and Solway family correspondence and cards. Abstract: The Marian P. Bloch Collection consists primarily of materials regarding Ardentown leaseholding and land values from the 1930s to the 1960s. It also contains documents related to the Arden School, Arden’s Fiftieth Anniversary, Ardentown town meetings, and Frank Stephens. Abstract: The Anne Russell Smock Collection consists of newspaper clippings, correspondence, newsletters, and other materials related to Smock’s life in Arden, Delaware. Abstract: The Cecilia Vore Collection consists primarily of Shakespeare Gild promotional materials designed by Ardenite Cecilia Vore. The collection also contains materials related to the Arden Players Gild and the Highway Ensemble. Abstract: The Hazel Stephens Collection contains ephemera about theater in the Ardens as well manuscript materials regarding Frank Stephens, Arden Day, and the Arden Club. Abstract: The Phyllis Conner Collection consists of materials on Ardencroft governance, tracts about the Ardens, community newsletters, news clippings about the Ardens and their residents, historical research on the Ardens, and documents related to the planning of Remembrance Day and the Arden Reunion. Abstract: The Hurlong Family Collection consists of materials related to Bunni and Lisa Hurlong as well as members of the Stephens and Ware families. The collection also contains ephemera about the Arden Building in Loan Association, theatrical productions, art exhibits, the Arden Club, and ACRA. Abstract: This eclectic collection assembled by Virginia Shaw and other residents of the Ardens contains materials related to various Arden institutions as well as the villages’ planning, safety, and community planning committees. It also includes material on the Single Tax movement from the early 20th century, documents related to the management of town records, materials from the Arden Arts assessment, and various newspaper clippings and ephemera related to life in the Ardens. Abstract: This collection contains letters to John G. Bechtel, a member of the Ardensingers and the Arden Repertory Players, programs and clippings related to his theatrical performances, and a pamphlet on Arden’s Raiffeisen Gild. Abstract: This collection consists of a letter written by Arden founder, Frank Stephens, to Estella Frankel, a musician and resident of Arden, on April 12, 1935. Abstract: ​This collection contains materials collected and created by Arden resident Frank Akutowicz, who lived in the village from 1954 until his death in 2004. Many items relate to the Arden Archives, Arden committees and governance, and local environmental and transportation issues. Abstract: This collection consists primarily of materials collected by Arden and Ardentown resident June Kleban from her arrival in the villages in 1953 until the mid-2010s. The collection not only documents Kleban’s deep involvement in village life, but also captures social, political, and artistic activities in the Ardens during this period.